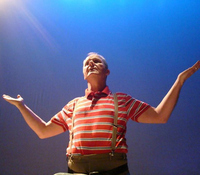 The Chronicles of Oggle is a tragicomic life story of an Irish ‘Everyman'. A man in his 50s, Pakie is a by-product of institutional Ireland. Pakie's childlike wisdom questions the very fabric of the society that has spawned him, a society of fanatical and institutional madness - a society that has fundamentally failed him. Although severely disadvantaged, Pakie is indomitable, and, he prevails no matter what the obstacles. Written and performed by Peter Gowen (Charlie, Love/Hate, The Butcher Boy), and directed by Donal Gallagher (Love All, Bedbound), this is a hilarious and heart-breaking story of small towns and even smaller minds. Premiering in 2013, Peter Gowen's tour de force performance received standing ovations, and was selected among the Irish Examiner Critics Choice Highlights of the year.